It’s always a blast from the past when I get hired by my former coworkers. And it makes me grateful that I didn’t keep quiet about my love for photography and couples back when I was running around in steel toe boots and safety glasses. Willie had been keeping up with my photography business after we parted ways at work, so when he reached out to let me know that he was engaged I was all over it! His fiance Hope and I had the pleasure of meeting via FaceTime months ago so she could take a virtual tour of my studio. She fell in love with the brick facade and enormous amount of natural light, courtesy of the loft windows. Hope and Willie’s engagement session was a prequel to what I’m sure will be a wedding for the books—music, throwbacks and new hits, laughs, reluctant smiles (cough cough Willie), and the classic two-step to Frankie Beverly and Maze “Before I Let Go”. Enjoy this sneak peek from their engagement session at my studio in the Village of West Greenville. Alix & Ryan, both natives of New York State, grew up not too far from each other. But it wasn't until they met in Greenville, SC at Soby's Restaurant that they became friends and eventually partners. Alix and Ryan married on a warm, South Carolina September afternoon at the beautiful Hotel Domestique in Traveler's Rest, SC. Congratulations, Alix + Ryan! I am so honored to have been part of your wedding day celebration. I am proud to call you friends. The two of you share a laugh. You find a moment of connection in which you completely forget I’m even there. All of my client’s favorite photos are those that are less posed and more moments. If you haven’t worked with me before you may wonder how in the world can I get this comfortable with my significant other AND have a stranger capture it. Well, first of all...I’m no stranger. Or at least, I won’t be by the time our session is over. I take building realationships (yes,I meant to spell it like that) with my clients very seriously. I respect the fact during a couples session you are making an investment to celebrate your relationship with photos, and in return, I invest time to get to know the two of you better. I believe that this is the first step in creating your most treasured images together. I also know that feeling comfortable on camera takes time as well and I will be sharing 3 ways you can feel comfortable on camera with your partner. I want us to reframe how we think about awkwardness. When we experience it, it is a level of unfamiliarity. Take away the initial nerves, stress, and discomfort from a situation and you no longer experience awkwardness. In order to get the photos you really desire, overcome the feeling of awkwardness by getting awkward. You are free to just be, no matter how many unfl attering faces you make or however many times you mistakenly blink mid-shot. Fun Fact: I’ve never received feedback from a client that said “hey, I look really silly in this photo” It’s not about how you look; it’s about how you feel during the session and the memories that come to mind when you look back at your albums. Preparedness is key no matter what kind of photo session you invest in. You can find many resources on what to wear for your engagement shoot, places to take your engagement photos, etc. But there is a a level of mental preparedness you must also be mindful of. Come prepared to love on your partner. Write down a few things you love most of about them. If you’re not comfortable with getting physically close on your own, I can’t promise to magically make your photos appear as if you do. Spend some time the day before your session, or even hours before, sitting next to one another, holding hands, making some time for genuine conversation. It’s a much needed ice breaker for going into a session where you plan to celebrate your connection. The prerequisite for a couples session that feels free, organic, and fun is to have a solid foundation, a little prep work done, and embracing each other for who you truly are. If you’re interested in booking a session with your significant other for an engagement, anniversary, or just because, contact me here so we can begin discussing how to create a session for you and your lover that leaves you with reminders of why loving them is worth it. Hey there! I'm Latoya & I'm a wedding and couples connection photographer. I understand that that being behind the camera can feel a bit uncomfortable if you only do it once or twice a year (if that many times), but I'm here to help allay those fears and provide you with photos that make you remember why being with your partner is absolutely worth it! Being a wedding photographer comes with some pretty sweet perks-- I get to meet new people, I get to take pretty pictures of people , and sometimes I get to eat cake. But I also get the opportunity to work alongside some incredibly talented individuals, fellow vendors who have a hand in making a wedding day vision come to life. One of those is Anna Stouffer of Urban Petals. Urban Petals is a floral and event design studio based in Greer, SC, just outside of Greenville. Urban Petals "offers exquisitely styled florals for weddings, events, and other life celebrations, as well as event design services. Anna and her team have won over plenty of southern brides, heart and soul, with timeless, luxurious garden-style designs. Urban Petals services clients throughout South Carolina, North Carolina, and Georgia from a beautiful studio in Greer, SC, and is available for travel." I met Anna back in 2016 when I started to plan my very first styled shoot at Bolt Farm Treehouse in Walhalla, SC. I had a vision in mind and Anna was committed to help me see it to completion. So committed that she actually came to the location on the day of the shoot and helped with everything from getting the models together, to styling to holding reflectors and assisting on the photography end. I loved how Anna brought her expertise in floral and styling to our shoot that day. It was later featured in publications like Borrowed and Blue and Catalyst Wedding Co. Having worked with her on location for this project showed me just the type of professional Anna is--committed, a team player, and willing to do whatever it takes to get the job done. If you're looking for a florist for your wedding or event, Anna and Urban Petals is my solid recommendation. When I contacted Cat to move forward with our consultation for hers and Lauren's wedding, she suggested that I meet her at the Tipsy Taco, a local Greenville taco joint. I knew that no matter the outcome, I would love them. Fortunately, they chose me to photograph both their engagement and their wedding. We met up at Falls Park which is an iconic Greenville landmark. The park is one of my favorite places to shoot at (and most requested) because there are several nooks and crannies you can find that look different for each couple. We explored the park and got some beautiful shots and later headed inside for coffee at Spill the Beans. Lauren sealed the cozy vibe by playing a song on her guitar. We ended the session by going to the Village of West Greenville. During that weekend the Great American eclipse was occurring. Cat and Lauren was prepared with their eclipse glasses. I met Lateatia this year through The Queen Photographers. She's been a constant source of laughs and support. When she reached out to me to capture her and her husband's anniversary photos, I was honored, especially since they'd be traveling up from Columbia. Lateatia and Charles must have brought the rain to Greenville because the first drop didn't fall until they arrived on location. It was outdoors and even though we had umbrellas, it didn't make for the comfort and coziness we wanted to show in their photos. We headed to Downtown Greenville to the Hyatt Regency. Contact me today to talk about the love you want to celebrate with a photo session. We'll be sure to make it 100% YOU no matter the weather. A consultation with your photographer usually focuses on what the photographer can provide you as a couple, but you should always be prepared to answer a few questions yourselves. If at all possible, I aim to schedule in-person consultations with any couple interested in hiring me to shoot their wedding. I am very much an introvert, but your wedding day is too much of a liability to be stuck with a photographer you who don't communicate well with or have any doubts about whatsoever. Consultations are a time for us to get to know each other-- for you to see how much I'd much rather hear the two of you talk about how the you met and for me to gage the best way to engage the two of you. Come wedding day the ice will be broken and we can focus on creating a day to remember. As someone who is genuinely interested in getting to know two individuals, I like to know the point at which you two first met and where you were as individuals. Not only does this give me a frame of reference for your interests, hobbies, and sometimes occupations, but there are times when we can schedule the engagement shoot at the same location--just like Alix and Ryan did here. What made you say yes? I ask this question to the partner who was proposed to. Alternately, I also seek to find out at what point the proposer found themselves ready to pop the question. And as soon as I do, the smiles begin to form. Who doesn't like to hear their partner praising them for being a kind, genuine, and supportive individual (at least that's usually what my couples have to say about each other)? Yes, your photographer should ask you about your budget. Talking about money usually puts people on edge, but at the end of the day your photographer needs to know whether or not they can offer you what you're looking for within a budget that suits you. If their pricing is outside of your budget, let them know. They shouldn't take it personally; it's part of doing business. And if they are within budget, be sure to let them know that too! Remember, this is a conversation. What is the most anticipated part of your wedding day? You never want to wait for your photos to be delivered from your wedding day and find that that one moment you wanted to hold onto is not in your album. Your photographer should be mindful of your most anticipated moment of the day so that all eyes (and lenses) are pointed in the right place at the right time. What type of photos in my portfolio do you like best? Okay, I lied. It's a little about me. But it's for your benefit. Asking which photos in your photographer's portfolio you like best is to ensure that you're hiring me for the unique style that I offer. There are times when clients book a photographer only to ask them to duplicate the style of another photographer. Make sure that what you see on my website and social media is what you expect to receive. When you're ready to schedule your consultation with me, be prepared for these questions. You'll find that meeting with me is not a sales pitch or an interrogation (by you or me), but a friendly conversation to determine how compatible we are. That's right, it's not just about your compatibility with your partner! I want to ensure that once you leave our consultation, you feel comfortable sharing your momentous wedding day with me. If you're engaged and ready to book with me for your wedding, reach out to me here to schedule your consultation! I look forward to meeting you (preferably over tacos or donuts)! When Ryan and Alix first met they both worked at Soby's in Downtown Greenville. He was a bartender and she was a server. Little did they know at the time they met at Soby's that they both grew up in and around the same area of New York. Nevertheless, they found each other right here in Greenville, SC. 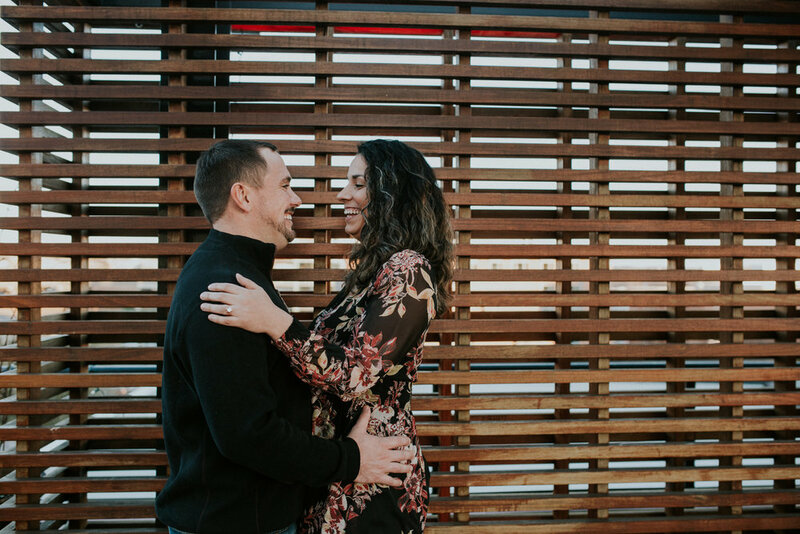 Because Soby's marked the beginning of their friendship and eventual relationship, Alix and Ryan decided to have their engagement session there. Little did I know that right behind the Soby's restaurant is another building called The Loft at Soby's where private events are held. Stepping into the building, we were led up a flight of stairs into what was a staged heaven for a photographer. There were several bars that made Ryan feel right at home and a quaint little living area where they got to relax and chat about their upcoming move back to New York. Not only that, but Ryan and Alix immediately got cozy. See their gorgeous photos below. Ready to book your engagement session? Contact me here!